Pauline joined Sharek & Co. in March 2016 as an articling student and was officially admitted to the Alberta Bar on July 14, 2017. Pauline originates from Saint-Hippolyte le Graveyron, a tiny little village in the south of France. After having completed 2 years of French Civil Law Pauline decided to explore Canada though a one year exchange program between the Université d'Avignon (France) and the Université de Moncton (New-Brunswick). Becoming passionate about the Common Law system she decided to stay to complete the Juris Doctor program. She then moved to Alberta for the sunny weather. 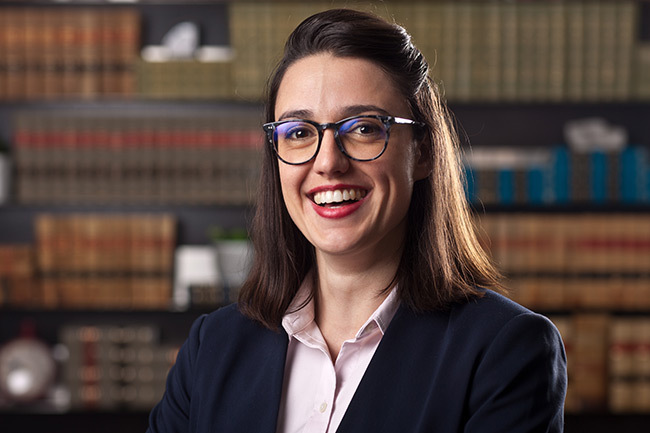 During her studies at the Université de Moncton Pauline was chosen to participate in Laskin moot, a national level competition in Canadian administrative and constitutional law. Genuinely concerned about others problems, you will find Pauline to be an attentive and helpful person. Outside of the office, Pauline spends her free time cooking. But she also loves outside activities and plans to get back to horse riding. In addition, Pauline enjoys swimming and most of all, bothering her husband.